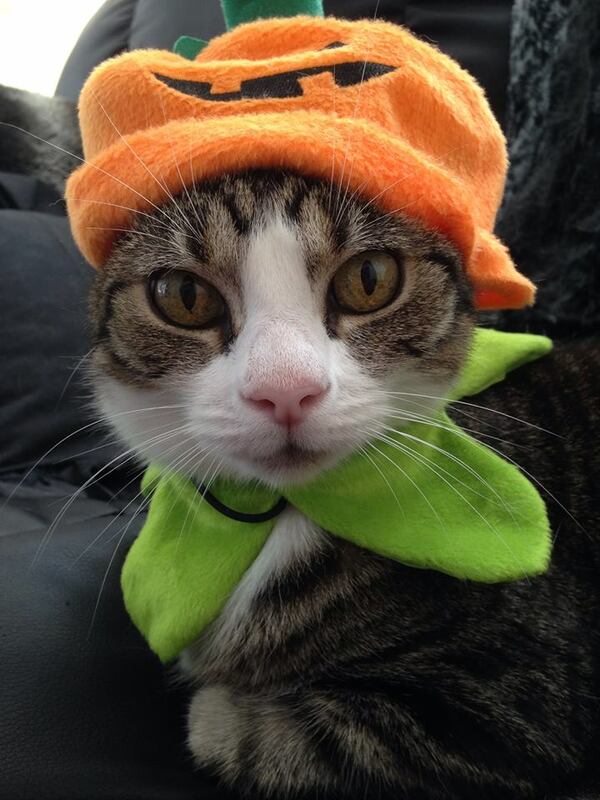 Halloween time can be fun for you and your pets. Here are a few things to consider so this time is full of treats and no tricks !! Popular Halloween decorations like decorated Pumpkins and corn stalks are relatively non-toxic but can cause stomach upset if nibbled on. Use non-toxic paint or better yet, keep pets away from decorations. A carved pumpkin is fun, but take caution if you add a candle. Pets can easily knock a lit pumpkin over and cause a fire. Curious kittens especially run the risk of getting burned. This is the time for lots of candy. Chocolate in all forms—especially dark or baking chocolate—can be very dangerous for dogs and cats. Candies containing the artificial sweetener xylitol can also cause problems. Lollipops and their sticks can be choking hazards and cause a painful obstruction or foreign body ingestion that may require surgery to remove. Raisins, a favorite of health-conscious revelers, are toxic for dogs and can cause renal failure. If you are putting up any electrical decorations, please make sure that cords and cords are not chewed on. Secure them so curious dogs or cats can not pull them and decorations down if they try to play with them. If you decide that you would love to dress up your pet, please make sure your pet is a “ham” and loves it. Some pets can get stressed even though we think it is cute. Also make sure that costumes are in good repair, no loose strings that can be eaten, no small choking hazards, flame retardant material. The costume should never restrict movement or impede breathing. If your pet seems stressed while wearing the costume, you may consider just having them wear a bandanna or going au natural. Take caution when opening your door to trick or treaters. if you have a cat or dog that loves to dart out the door, please secure them in a room during the hours of trick or treat. IDs, please! Always make sure your dog or cat has proper identification. If for any reason your pet escapes and becomes lost, a collar and tags and/or a microchip can be a lifesaver, increasing the chances that he or she will be returned to you. Especially BLACK pets, during this month. If you you must let them outside, please do it under supervision. We hate to say it, but this is the time of the year that pets, especially BLACK pets are stolen. They are used for sacrifice in cults and other not nice things. Children can be very cruel at this time of year as well. If you will be leaving your pet at home during the trick or treating in your neighborhood, have a pet sitter stay with your pet if they are nervous with people walking by or ringing the doorbell or maybe setting off firecrackers. We can come before the set time for trick or treating and let them out to go to the bathroom, or just come by for a visit to make sure they are okay or stay for the entire time of trick or treating and make sure they are comfortable before we leave. Make your reservation Now for your November and Thanksgiving holiday pet care reservation. You may even want to think about December and New Years pet care as well. Black dogs or cats are the hardest to find homes for. Please consider pets that have been born with black coats. You may find that shelters and rescues may be a bit cautious at this time to adopt out. This is because they care for the pets they are responsible for. This is the time of year that all black pets, especially cats, may be in danger, as mentioned above.